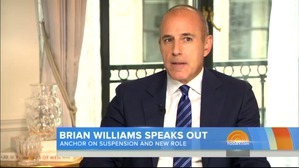 Williams' stiff, almost robotic excuses for his lies responses to Lauer, such as, "This clearly came from a [pause] Bad Place, a bad urge" and "I think it must have been ego that made me do it"
Lauer: Did you give thought to going on the air at the time and saying, "I lied"? 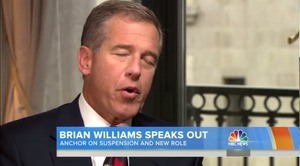 Williams: [pause] I know why people would see it that way. 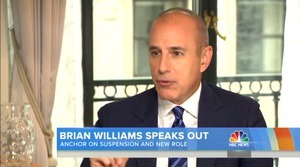 All screenshots were borrowed from NBC and are owned by that company.